A Life of Sugar and Spice: More Gluten Free Chex! 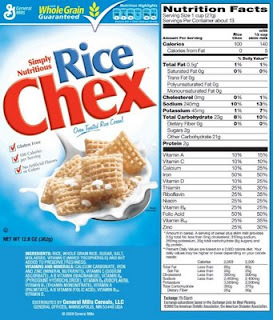 The gluten-free blog-o-sphere is a buzz with the news that General Mills has updated many of their Chex cereals to be gluten-free!! We've had Rice Chex for a while, but now we have Corn Chex, Honey Nut Chex, Chocolate Chex, Strawberry Chex and Cinnamon Chex. This is such awesome news!! I can't wait to try the Honey Nut and Cinnamon versions. I'm very fortunate to live in the Boston area because when food companies start rolling out new products, they often start in more urban areas. I saw GF Corn Chex at my supermarket the other day but was not yet aware of the other varieties so I didn't look for them. I've read that the others aren't going to be released until June 1st but I'm going to check for them anyway. I've also read recently about Betty Crocker's new line of GF baking mixes. It made me realize that before going GF I rarely bought baking mixes, but after going GF I started baking a lot more often because it was something that I could do very easily and it helped me to make the transition. I'm sure I'll by trying out the Betty Crocker mixes but probably only when I need something to bring to a party or holiday. I'm really trying to keep the sweets to a minimum, as difficult as that is! oooh -- I just blogged about Corn Chex, didn't hear about the other ones! NIIIICE. Honey Nut Chex used to be my sugar cereal of choice on the rare occasions my parents let me have it. Time to pick up a box, I think.